Directories are a valuable resource for local, family and social historians as well as for researchers in other fields of Australian history. And this one is a gem for anyone exploring a family history in Brisbane and building a family tree! This Brisbane Directory and Squatters Guide, contains a comprehensive Brisbane Street directory, Brisbane and suburbs alphabetical and trades & professional directories and much more. 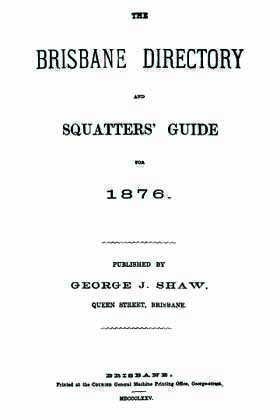 It also includes a Queensland Squatters directory, which list the names and address of many squatters in Queensland in 1876. Directories are an extremely useful tool for establishing when and where a person lived. However this is just a starting point - look further in the directory to find out more information about the society in which they lived, the occupations they held and the people they knew. This is a truly fascinating and useful data record.